Seriously, the GOODFOODS Tableside® Chunky Guacamole is so tasty. It is made with all real ingredients and no preservatives! 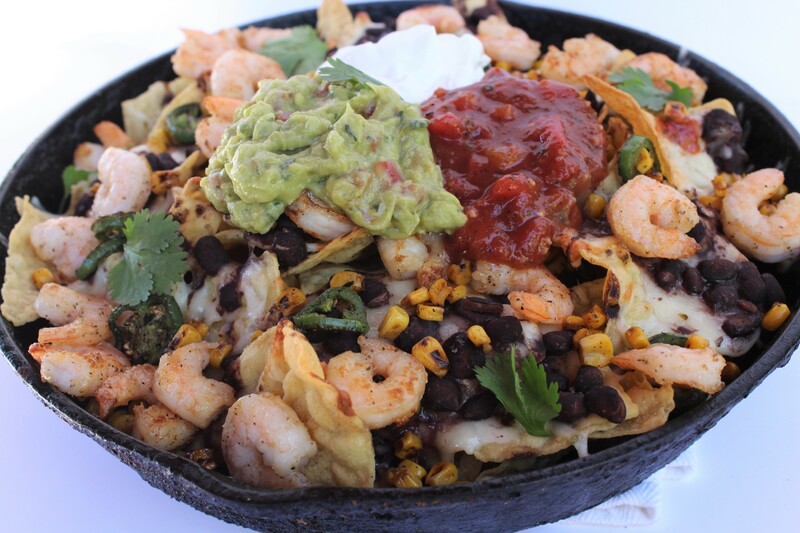 It tastes homemade, it’s healthy and it adds the perfect touch to your shrimp nachos. GOODFOODS Guacamole is always fresh and never heated so all your get is fresh flavor. In my area of Southern California I bought my GOODFOODS product at Target in the refrigerated section. It can also be found at Sprouts and Costco. Check out their website’s store locator to find it in your area. I want to try all the flavors! Also, can we talk about this amazing cast iron skillet? It’s my moms, and she has been cooking in it for at least over 20 years. I love it! If you don’t have a cast iron skillet bake your nachos on a baking sheet or another oven safe pan. Make your own Shrimp Nachos with Roasted Jalapeños at home, and don’t forget to check out GOODFOODS Tableside® Chunky Guacamole! I left some helpful notes at the end of the recipe. It is a perfect dish to make during the holidays for friends and family or anytime you want a special treat. 1. Shred pepper jack cheese and set aside. It melts better if you shred it yourself instead of buying it pre-shredded. Preheat oven to 400 degrees. 2. Heat a dry skillet on the stove over high heat and add corn kernels and salt and pepper to taste. Let them brown on both sides stirring occasionally. They roast very quickly, so do not leave the stove. Remove from heat and set aside. Do the same thing with the jalapeño slices and set aside. 3. In the same skillet over medium high heat add butter, shrimp, salt, pepper and garlic powder to taste. Cook just a couple minutes on one side then flip and cook the other side. Shrimp should just turn pink to cook through, do not overcook. Remove from heat and set aside. 4. Arrange chips in a large cast iron skillet or any oven safe pan and top with shredded cheese. Top cheese with drained black beans. Bake in the oven for 5-8 minutes or until all cheese is melted completely. Remove from oven and immediately top with roasted corn, roasted jalapeños, shrimp, sour cream, salsa, guacamole and cilantro. • Buying a bag of frozen shrimp is a great money and time saver. You can buy them already peeled and deveined. Thaw the shrimp in a bowl of room temperature water. Pull off the tails easily if they are still on. Pat the shrimp dry on paper towels before cooking. • I like to buy canned black beans that are already seasoned with onion and spices. I drain the juice out but do not rinse the beans so they keep some of their flavor.